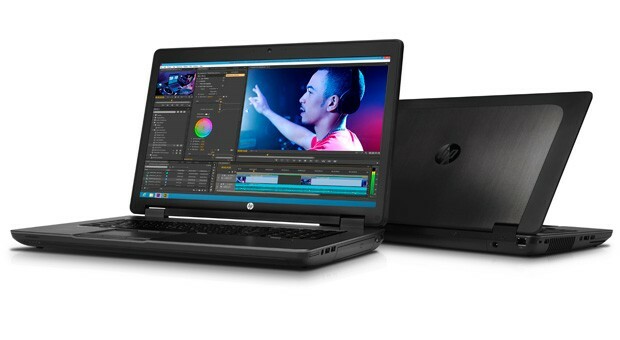 HP's 2012 mobile workstation range was powerful, but would we have called it exciting? Not exactly. The company may just liven things up with its new ZBook line, however. The three-laptop series is based on a thinner and lighter design template that includes a 14-inch Ultrabook variant, the ZBook 14 (pictured above). Basically, Dell's Precision M3800 now has a big-name competitor. Those willing to trade some portability for power will also get a few welcome additions. The mid-size ZBook 15 (after the break) has a 3,200 x 1,800 display option, while both the ZBook 15 and the flagship ZBook 17 carry Thunderbolt ports. All three PCs ship with Haswell-based Intel processors as well as the latest pro graphics from either AMD or NVIDIA. Mobile workers can order the 15- and 17-inch ZBooks today, or wait for the 14-inch system's arrival in late October. You'll find more details of HP's workstation updates after the break, including a more conservative refresh to the Z desktop line that brings Ivy Bridge-based Xeon processors and Thunderbolt 2. PALO ALTO, Calif., Sept. 10, 2013 - HP today announced the expansion of its Z portfolio of professional workstation and display products, including the world's first workstation Ultrabook™-the HP ZBook 14-and the industry's first line of workstations to offer Intel's Thunderbolt technology for high-speed data transfer. The HP Z family of products is engineered to meet the needs of the world's most demanding customers, where mission-critical operations require the best performance and reliability. The first workstations to incorporate Thunderbolt, select HP Z Mobile and Desktop Workstations now can take advantage of high-speed data transmission between Z Workstations, displays and peripherals, providing the industry's fastest, most versatile I/O connection. "Professional customers rely on trusted partners to provide technology solutions that are tested and certified for the mission-critical applications they run," said Jim Zafarana, vice president and general manager, Commercial Solutions Business Unit, HP. "The HP Z subbrand has become a hallmark for professional products engineered to the highest standards-the expansion of the Z portfolio demonstrates HP's commitment to the professional market that many other vendors have abandoned." With the introduction of the HP ZBook portfolio, HP has reinvented the mobile workstation and infused it with the HP Z DNA that customers around the world have come to recognize. The new HP ZBook Mobile Workstations now feature a new thinner and lighter industrial design. The HP ZBook family includes the world's first workstation Ultrabook-the HP ZBook 14-as well as the HP ZBook 15 and 17. Designed for workstation-class professionals that demand mobility, the new HP ZBook Mobile Workstations feature 4th Generation Intel® Haswell dual- and quad-core processor options(4) and next-generation graphics technologies from NVIDIA and AMD, including the newly announced Keplar-based professional graphics from NVIDIA. The HP ZBook Mobile Workstations all feature innovative tool-free chassis for easy upgrades and serviceability. Adding to the already powerful line of HP Z Desktop Workstations, the HP Z420, Z620 and Z820 Workstations have been updated to include the latest Intel Xeon® E5-1600v2 and E5-2600v2 families of processors-also called Ivy Bridge-as well as new memory running 16 percent faster and 2nd generation Thunderbolt ports for creative work flows. The addition of Thunderbolt will accelerate creative projects with data transfer speeds up to four times faster than USB 3.0, easily connecting multiple devices with just one single, compact Thunderbolt port. The dual-socket HP Z820 Workstation delivers exceptional performance, award-winning industrial design and tool-free serviceability in the industry's most expandable chassis. The HP Z820 offers up to 24 processing cores, up to 512 GB of ECC memory, up to 15 TB of high-speed storage, and up to two NVIDIA K6000 graphics. The HP Z620 Workstation packs computing and visualization power into a quiet, compact footprint. The HP Z620 is HP's most versatile workstation, providing up to 24 discrete processing cores, up to 192 GB of ECC memory, up to 12 TB of high-speed storage, and up to NVIDIA K6000 or dual NVIDIA K5000 graphics for high-speed graphics performance. HP's most popular workstation, the HP Z420, includes up to eight processing cores using the latest Intel Xeon processor E5-1600 v2 and E5-2600 v2 product families, providing up to 64 GB of ECC memory, up to 12 TB of high-speed storage, and NVIDIA Quadro K6000 or AMD W7000, or dual NVIDIA K2000 graphics. The enhanced HP Z420 Workstation provides new levels of performance and expandability in an accessible tool-free mini-tower form factor-and at a great price. Adding to the company's line of professional displays, the new HP Z27i and Z30i IPS Displays are ideal for designers, content creators and knowledge workers across the enterprise who need outstanding image accuracy, exceptional adjustability and mission-critical reliability optimized for professionals. The new displays provide excellent coverage of the sRGB color space-the standard color space for the web, and for the majority of engineering, creative and professional applications-with the HP Z27i and Z30i both offering 100 percent coverage. The HP Z30i also covers 100 percent of the Adobe® RGB color space, commonly used in photography and digital prepress workflows. Built with IPS Gen 2 panels, HP Z Displays deliver a power savings of up to 37 percent compared to HP's first-generation IPS technology products, yet still deliver the same excellent color accuracy across wide viewing angles as compared with IPS Gen 1. The HP Z Displays are ENERGY STAR® qualified and EPEAT® Gold registered. Both displays feature an HP four-way adjustable stand that includes the HP QR2 quick release and both are TCO Certified. To free up valuable desk space, an HP Thin Client Mount Kit also is available for both the HP Z27i and Z30i, allowing users to securely mount an HP Thin Client or Ultra Slim desktop to the back of the display. · The HP ZBook Mobile Workstations 15 and 17 are available worldwide today and the HP ZBook 14 is planned to be available in late October. · The enhanced HP Z420, Z620 and Z820 Workstations are planned to be available worldwide in October starting $1,399, $1,689 and $2,439, respectively. · The HP Z27i is planned to be available in October starting at $729, and the HP Z30i Display is available today starting at $1,329.